More than 2 billion people around the world are infected with hepatitis, a staggering figure that equals nearly one-third of the globe’s population. Injection drug users are particularly vulnerable to the disease and new data out in the Lancet Wednesday estimates 67 percent of injection drug users are infected with hepatitis C, a strain most often transmitted through infected blood. Unsafe drug injection is a major risk factor for hepatitis, a blood-borne virus which attacks the liver and kills about one million people each year, yet surveillance among users is spotty and the issue has not received enough attention, public health experts say. To mark World Hepatitis Day Thursday and draw attention to the issue, the Lancet published the first ever global estimates of hepatitis among injections drug users. Researchers found that more than 10 million are infected with hepatitis C, and more than 1.3 million have been also been exposed to hepatitis B. There are five strains of the disease. Hepatitis B and C are passed through bodily fluids, and together cause nearly 80 percent of liver cancers. Hepatitis A and E are typically caused by ingestion of contaminated food or water. The research, done by a team from the University of New South Wales and funded by the National Institutes of Health and the World Health Organization, used data from 77 countries for the hepatitis C estimates, and 59 for B estimates. They determined infection based on the presence of antibodies in the blood. “The public-health response to blood-borne virus transmission in [injection drug users] has mainly centered on HIV,” the authors wrote. While HIV prevention efforts need to be maintained, “the significance of viral hepatitis needs to receive greater attention than it does at present,” with better access to effective vaccinations and treatment, as well as harm reduction measures like needle exchange programs. 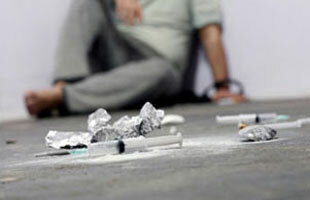 Eastern Europe and Asia have the largest populations of injections drug users infected with hepatitis, researchers found, but more than 70 percent of injections drug users in the United States, France, Germany, Norway and Spain were also infected with hepatitis C.
“If you look at many countries around the world [injections drug users] are extremely marginalized,” said Joseph Amon, director of health and human rights at Human Rights Watch, who wrote an accompanying comment for the Lancet. Russia, for example, has a growing injection drug use problem but has outlawed methadone substitution therapy, Amon said, and the country has done little to address the health needs of injected drug users. Drug addiction is a powerful and dangerous disease in its own right, so any effective intervention for injection drug users for a particular disease must also address substance abuse treatment and mental health counseling, Amon said. Photo courtesy the World Health Organization.